Tanglegrams are a very cool way of visualising the difference between two trees. There is an implementation in Dendroscope that allows them to be made very easily, IF you know how (it isn’t covered very well in the documentation). This is how. This is definitely one of those, ‘write it down before I forget’ blogs. As usual, YMMV. You have two trees with identical labels, There are no associated bootstraps (if you load into figtree and export as a newick, with no options selected, this should get rid of them). If you have bootstraps then Dendroscope will link instances of the same bootstrap value, resulting in a hideous mess. First, you open one tree in Dendroscope. Then View > More panels (this has to be done while you have the first tree selected, you can see which one you have in the bottom left corner, navigate between them using the arrows in the top left corner). The second tree should now pop into view, alongside the first. 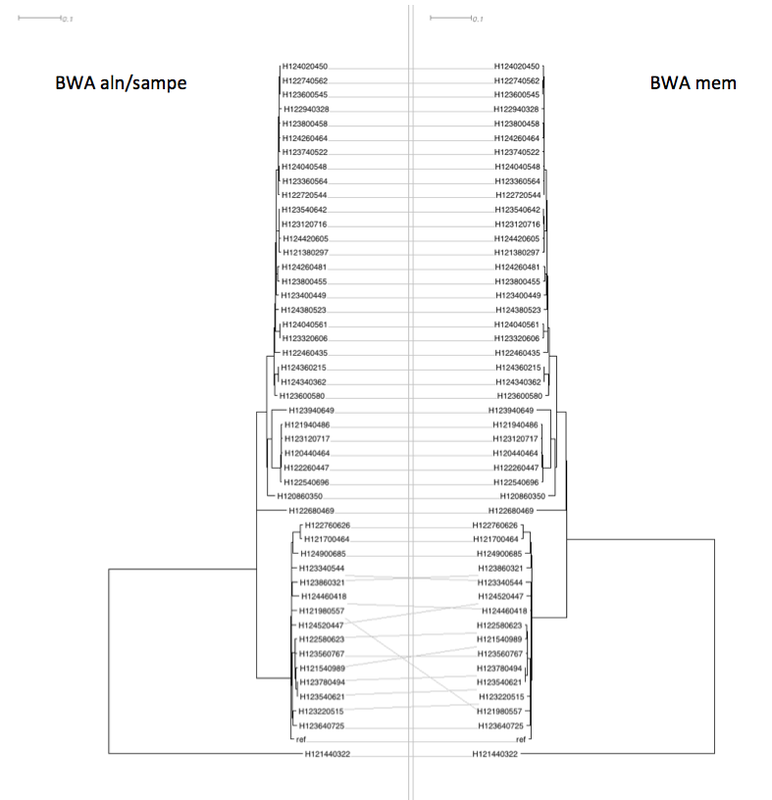 Here is one I made earlier to compare BWA aln-sampe with BWA-mem (see next blog for more details).